In Canada, "high-level nuclear waste" refers to used nuclear reactor fuel, sometimes referred to as "spent nuclear fuel" or "nuclear fuel waste". Strictly speaking, discharged power reactor fuel in Canada is neither "waste" nor "spent", since it retains a significant energy potential (see related FAQ and article on advanced fuel cycles in CANDU reactors); however, since reprocessing of used power reactor fuel is not currently practiced in Canada, the terminology does have meaning in the context of current Canadian nuclear operations. Used nuclear fuel is highly radioactive, particularly within a few years of its discharge from the reactor core. The radiation is emitted by both the fission fragments (what the uranium atoms become after they split roughly in half) built up over the duration of the fuel's residence in the reactor core, and the higher actinides (what the uranium atoms become after they absorb a neutron and fail to split). The need to adequately isolate the radionuclides in used nuclear fuel from the biosphere was recognized at the outset of Canada's nuclear program in the late 1940s and 1950s, with research and development in this field progressing apace with the development of the industry. As Canada's nuclear power program geared up in the 1950s the research focused upon the reprocessing and subsequent recycling of the useful fraction of used fuel, due to the then-perceived limited availability of uranium ore. In this case, for example, the leftover waste from reprocessing would have been incorporated into glass blocks, which had been confirmed through field tests to be resistant to leaching [1, 2, 3]. By the late 1960s, with uranium known to be an abundant Canadian resource, the focus shifted to a once-through fuel cycle and the direct isolation of the resulting used fuel without reprocessing . The time-scale for this isolation can be separated into "interim storage" and "long-term management" requirements. Since used reactor fuel is compact, solid, small in volume, and stable in a water environment, interim storage is a fairly straight-forward process. 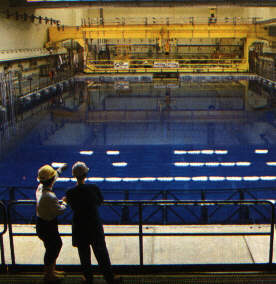 Used fuel from each reactor is stored on-site in deep water pools used for cooling and shielding. There are about two million used fuel bundles (0.5 m long, weighing 20 kg each) in Canada, which would fill a soccer field to the height of a player. Once a few years have passed, the used fuel may be moved to above-ground dry storage in concrete canisters, with passive cooling provided by air flow. Both the wet and dry forms of interim storage address the two short-term safety requirements of used reactor fuel, cooling and shielding, with relatively simple technology and inexpensive materials. The cooling, by either water or air flow, is required because used fuel contains a small inventory of fission products (created by the fission of less than 2% of the original uranium inventory) that continue to emit energy as they radioactively decay. In fact, immediately upon removal from the reactor core, a used CANDU fuel bundle generates about 10% of the heat that it produced in the core, but this figure drops to about 1% only a day after removal, and less than 0.1% after a year has passed. The average heat generation of a fuel bundle at this point (one year) is about 100 W -- comparable to a household lightbulb. The radiation accounting for this heating creates a simultaneous need for shielding. About three metres of water are sufficient to absorb the radiation emitted initially by the used fuel, while in the dry-storage phase about a metre of concrete suffices. Unshielded, the radiation dose measured at a distance of 30 cm from a used CANDU fuel bundle, one year following discharge, would be about 50 - 60 Sv/h (5000 - 6000 rem/h) , which is lethal after a few minutes' exposure. The radiation level drops to about 1 Sv/h after 50 years, 0.3 Sv/h after 100 years, and less than 0.001 Sv/h (100 mrem/h) after 500 years. At this time the major hazard from the used fuel is no longer one of external exposure; for example, by these estimates, spending an hour about a foot away from a 500-year-old CANDU fuel bundle would result in radiation dose about 1/4 of the average annual background exposure, and thousands of times less than what is known to lead to physical harm. However, a significant hazard continues to be associated with internal exposures (for example, from inhalation, ingestion, or absorption of long-lived plutonium isotopes), and therefore an effective long-term management strategy is needed to isolate the used fuel and prevent its uptake into the biosphere. Some idea of the duration of the significant hazard is provided by the graph on the right , depicting the relative toxicity of used CANDU fuel in ground water over time, compared with uranium and other natural ores. 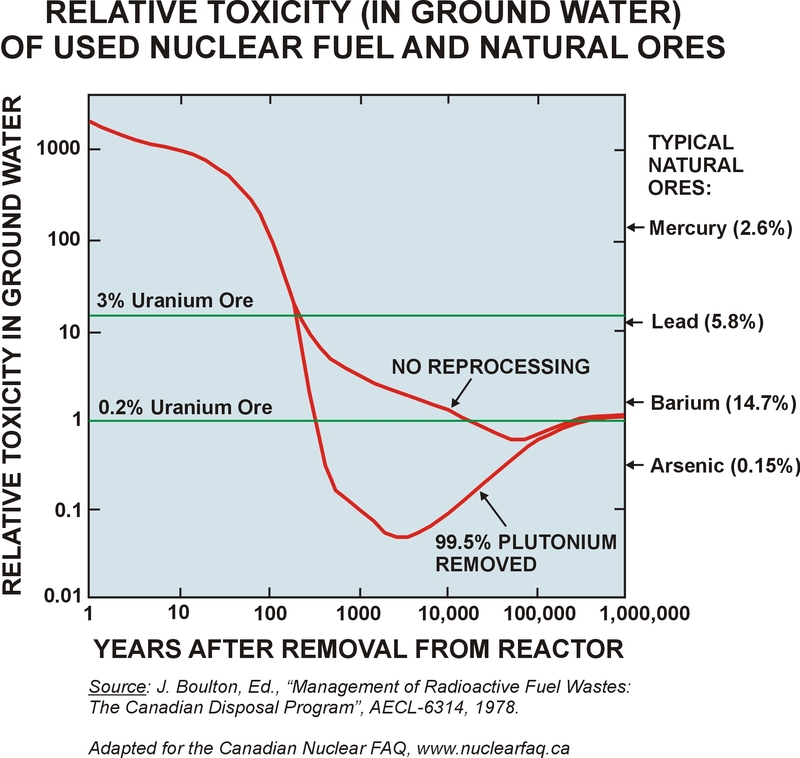 Through natural decay of the radioactive isotopes in the used fuel, a comparable toxicity with high-grade uranium ore (such as that found in Canada, although the current average ore grade is Canada is actually closer to 20% — see related FAQ) is reached after several centuries, and with lower-grade uranium ore after about 10,000 years (unless the used fuel is chemically processed to remove and recycle long-lived actinides like plutonium, in which case the time to comparable toxicity with uranium ore is again measured in centuries). As with many countries with a significant nuclear power program, Canada has focussed its research and development efforts for the long-term management of high-level nuclear waste on the concept of Deep Geological Disposal (DGD). In 1975 the Canadian nuclear industry defined its waste-management objective as to "...isolate and contain the radioactive material so that no long term surveillance by future generations will be required and that there will be negligible risk to man and his environment at any time. ... Storage underground, in deep impermeable strata, will be developed to provide ultimate isolation from the environment with the minimum of surveillance and maintenance." . In 1977 a Task Force commissioned by Energy, Mines and Resources Canada (led by Dr. F.K. Hare and known as the "Hare Report") concluded that interim storage was safe, and recommended the permanent disposal of used nuclear fuel in granitic rock, with salt deposits as a second option . This recommendation was echoed shortly afterward by a concurrent Royal Commission on Electric Power Planning (led by Dr. Arthur Porter and known as the "Porter Commission") [9, 10]. In response to the Hare Report, the governments of Canada and Ontario jointly established in 1978 the Canadian Nuclear Fuel Waste Management Program (CNFWMP). Under the program the federal government, through its crown corporation Atomic Energy of Canada Ltd. (AECL), had responsibility for managing the program and developing the technology for long-term disposal of used nuclear fuel, while the province of Ontario, through its electrical utility Ontario Hydro (now known as Ontario Power Generation, or OPG), had responsibility for advancing the technologies of interim storage and transportation. Other partners included federal departments within Energy, Mines and Resources Canada (now Natural Resources Canada) and Environment Canada, as well as several Canadian universities and consultant companies. The governments of Canada and Ontario subsequently (1981) directed the CNFWMP to focus on a generic design that did not require a specific siting decision. In 1988 the CNFWMP, through AECL, submitted its generic (non-site-specific) proposal  for long-term nuclear used-fuel management to the federal government, which initiated an Environmental Review process that ultimately took ten years to conclude. Under the proposal, the used fuel would be placed in disposal vaults about 500 to 1000 metres deep in the granite rock of the Canadian Shield. The "formations of choice" are large, single intrusions called batholiths, formed between one and two billion years ago, and geologically stable since that time. Other criteria met by grantitic batholiths are low mineral (and therefore economic) value, and low ground-water movement rates. Used fuel would be encased in corrosion-resistant containers designed to last thousands of years, and surrounded by a buffer material (such as bentonite clay) that retards water migration. The vaults, tunnels, and shafts of this disposal site would be backfilled and sealed during its closure stage. The safety design of the emplacement technology has been developed with the conservative assumption that the fuel-bearing containers will only last a fraction of their design life. The technology also does not depend on long-term institutional controls, and is adaptable to future societal requirements and changes in criteria. A specific site has not been sought at this stage, as mandated by the joint decision of the federal and Ontario governments in 1981 to develop only generic technology for initial review. However, key site characteristics (distance from post-glacial faulting, low mineral value, low ground-water movement, size and uniform nature of plutonic rock, etc.) have been defined in preparation for the siting stage of the program. Depending on the size chosen for the facility, the total project cost is estimated at between CDN$9 and CDN$13 billion, spread over a 60- to 90-year period (during most of which, about 1000 people would be employed in the construction and operation). Electricity users in Ontario, Quebec, and New Brunswick currently contribute about 1% of their electricity costs towards a fund for future long-term nuclear waste disposal. The Canadian technology was designed to address the one credible mechanism by which radionuclides from the used fuel can be transported to the surface: ground-water migration. With the current plan, transport times to the surface are measured in the hundreds of thousands of years, and therefore the effects of the used fuel on the biosphere are maintained at negligible levels. The technology of immobilizing radionuclides in the geosphere is verified by natural "analogues" (see related FAQ) which possess similar characteristics. Notwithstanding the geologic timescales involved, should dissolution and migration in ground water occur, the above figure suggests that the toxicity of the radionuclides released from used reactor fuel (measured in terms of the volume of water required to dilute the material to drinking water standards) would become comparable, after an initial radioactive decay period of several hundred years following discharge from the reactor (i.e., well within the expected lifetime of the waste-bearing containers), to that of naturally occurring high-grade uranium ore deposits found in Canada, as well as other toxic ore materials such as lead and mercury . The long-term health risk associated with used nuclear fuel in underground repositories is therefore significant but not unprecedented. Today, Canada's long-term nuclear used fuel management program is currently administered by the Nuclear Waste Management Organization (NWMO), established in November 2002 under the Nuclear Fuel Waste Act (June 2002). Oversight of the NWMO is provided by Natural Resources Canada, which has also set up a Nuclear Fuel Waste Bureau to enhance public participation in the decision-making process. The final report of the NWMO was released in November 2005, recommending a strategy of "Adaptive Phased Management". The strategy is based upon a centralized repository concept, but with a phase approach that includes public consultation and "decision points" along the way, as well as several concepts associated with centralized storage (vs. disposal), and the ability to modify the long-term strategy in accordance with evolving technology or societal wishes. The approach of Adaptive Phased Management was formally accepted by the federal government on June 14, 2007. The NWMO is financed from a trust fund set up by the nuclear electricity generators and AECL. These companies were required to make an initial payment of $550 million into the fund: Ontario Power Generation (OPG), contributed $500 million, Hydro-Quebec and New Brunswick Power each paid $20 million, and AECL contribute $10 million. The participants are also required to make annual contributions ranging between $2 million and $100 million (one-fifth of their respective initial contributions). Following the NWMO's initial nation-wide consultation campaign, it initiated a siting process that eventually lead to a selection of a volunteer host community for the repository. Another important component of the disposal plan is the transportation of nuclear fuel to the disposal site. In Canada this aspect, originally the responsibility of the Ontario utility, Ontario Power Generation Inc., is now within the mandate of the NWMO. Special transport casks have been designed that are able to withstand severe accidents. The battery of tests applied to these casks include being dropped 9 metres onto a hardened surface, exposure to an 800 degrees Celsius fire for 30 minutes, and immersion in water for 8 hours. The development of such specialized containers has proceeded in parallel with efforts in other countries. Sandia Labs in the U.S., in particular, has published some remarkable photographs of severe crash tests performed on one such design. A.M. Aikin, "Disposal and Uses of Fission Products", Canadian Chemical Processing, 38, 98, also AECL technical report AECL-158, 1954. A.R. Bancroft and J.D. Gamble, "Initiation of a Field Burial Test of the Disposal of Fission Products Incorporated into Glass", AECL technical report AECL-718, 1958. 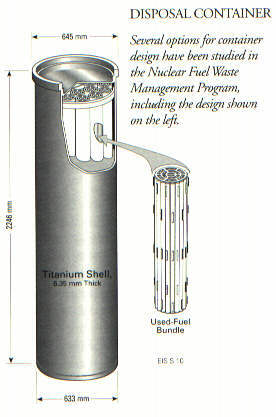 Managing Canada's Nuclear Fuel Wastes, AECL public affairs booklet, 1989. P.J. Dyne, �Managing Nuclear Wastes�, AECL technical report AECL-5136, May 1975. F.K. Hare (Chair), A.M. Aikin, and J.M. Harrison, The Management of Canada's Nuclear Wastes, Energy, Mines and Resources Canada Report EP77-6, 1977. A. Porter (Chair), A Race Against Time", Interim Report on Nuclear Power in Ontario, (Ontario) Royal Commission on Electric Power Planning, Queen's Printer for Ontario, 1978. A. Porter (Chair), The Report of the [Ontario] Royal Commission on Electric Power Planning: Vol.1, Concepts, Conclusions, and Recommendations, Queen's Printer for Ontario, 1980. Environmental Impact Statement on the Concept for Disposal of Canada's Nuclear Fuel Waste, AECL technical report AECL-10711 (also a CANDU Owner's Group (COG) report, COG-93-1), available in French, 1994. The science of waste disposal attempts to predict the long-term geochemical and hydrologic behaviour of a repository, based upon knowledge of the processes involved and the expected environment. The parameters used in the analysis come largely from experiments in the laboratory, including those carried out in situ within AECL's "Underground Research Laboratory" deep in the Canadian Shield northeast of Winnipeg, Manitoba. Although laboratory tests can also be used to validate the methodology, and thus increase confidence in the predictions made, the long-term results obviously remain unconfirmed due to the time scale involved. Fortunately, verification of the long-term behaviour of significant geochemical and hydrologic processes, in typical repository environments, can be found abundantly in Nature. These "natural analogues" of waste repositories are found around the globe, some with more relevance to the Canadian disposal concept than others. The most remarkable natural analog is the Cigar Lake uranium deposit recently discovered in northern Saskatchewan, Canada. Representing about 11% of the world's known uranium reserves, Cigar Lake is one of the richest and largest uranium deposits known to mankind. 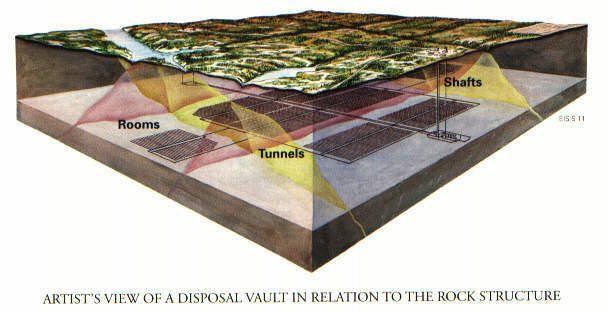 Its significance to the science of waste disposal is due to two factors: (1) it exists in about 98% abundance as uranium dioxide, UO2, which is the same form as reactor fuel; and (2) the high-grade ore is protected from groundwater by a covering "dome" of clay (see diagram), which is conceptually similar to Canada's disposal plan. Additionally, the high grade of the ore permits the interaction between the uranium and the host material to be analysed in a highly sensitive and unique manner. Despite emplacement in highly permeable sandstone host rock, the Cigar Lake ore deposit has survived roughly 1.3 billion years of geologic history, chiefly because of its natural clay buffer. The clay immobilizes the uranium by reducing both the penetration of groundwater into the deposit, and the diffusion of uranium atoms out of the deposit. Remarkably, the deposit has remained intact through several mountain-building episodes (the Rocky Mountains, the Appalachians), the trauma of continental drift, multiple ice ages, and significant uplift caused by the erosion of over 2.5 km of overlying sedimentary rock. In fact, it is so stabilized in its position, currently 430 metres below the surface, that no chemical or radioactive signature can be detected on the ground above it. Since the Canadian waste disposal concept calls for a much less permeable host rock (batholithic granite), and a superior clay buffer (bentonite clay, rather than Cigar Lake's illite clay), the barriers to water movement and radionuclide migration proposed in the Canadian plan are verified by Cigar Lake. Less relevant macroscopically, but still an important analogue for radionuclide-clay interaction, is the bed of Loch Lomond in Scotland. One of the layers of clay in this lake bed contains significant concentrations of uranium, radium, iodine, and bromine deposited from lake water about 6000 years ago. The clay reduces the diffusion properties of highly mobile elements like iodine, and the verification of this phenomenon can be found in Loch Lomond's 6000-year-old "experiment". The first significant natural analogue discovered was the series of "natural reactors" at Oklo in Gabon, Africa. Here, the remains of at least six natural reactors, 2 billion years old, were found by a French uranium company in 1972. The fission chain reaction took place when uranium was exposed to the moderating effects of groundwater flow, and continued to operate for something like a million years. As in any nuclear reactor, radionuclides were produced, including plutonium. All of these have long decayed by now, but their signatures remain, leaving a two-billion-year-old record of their migration behaviour. It can be determined, for instance, that the atoms of plutonium produced never moved from the grains of uranium where they were formed, despite exposure to ground water movement for over two billion years. Another analogue of plutonium migration is Morro de Ferro, "hill of iron", in the Minas Gerais highlands of Brazil, one of the most radioactive places on earth. Here a large thorium ore body embedded in the hillside is exposed to groundwater flow, and provides a chemical analogue for plutonium under similar conditions. It has been shown that, had the deposit been of plutonium, the concentration downstream would be safely below the drinking water standard. In the case of uranium deposits with less relevance to the Canadian disposal concept (i.e. lacking a clay environment, or found predominantly in a molecular form other than UO2), valuable information can still be found concerning the migration behaviour of uranium under various conditions. The Alligator River ore body in Australia is one example where an internationally funded study is underway. Another is the uranium deposit near the town of Pocos de Caldas in the same Brazilian highland area as the "hill of iron" mentioned above. Here a redox front is tracked as it moves progressively down towards bedrock. Where clay deposits can be found in conditions relevant to a waste disposal repository, but with no radionuclides present, database information can still be gleaned. A good example of an area of study not requiring radionuclide interaction is the study of clay's thermal behaviour. This is important since waste disposal containers will be hot due to internal heating (up to 100 degrees C). Studies of naturally-heated clays underlying volcanic rock in Sardinia, and buried a kilometre below the island of Gotland, have shown that thermally-altered clay still retains its swelling and sealing properties, even after millions of years. Similarly, the sealing properties have been found to remain in Canadian clays that have dried out to the point of cracking. Another area of study is the ability of certain organic molecules to increase the mobility of radionuclides - in particular, the organic molecules created by the biodegradation of items like paper in the repository. In this case, important information on the preservation properties of clay is found in a certain clay quarry in Italy. This quarry contains fossilized tree trunks from an ancient forest flooded about one million years ago, providing remarkable evidence and data for the scientists modelling biodegradation in such an environment. "Natural Analogues of Waste Repositories," Nucl. Energy, 29, 2, p.86, April 1990. 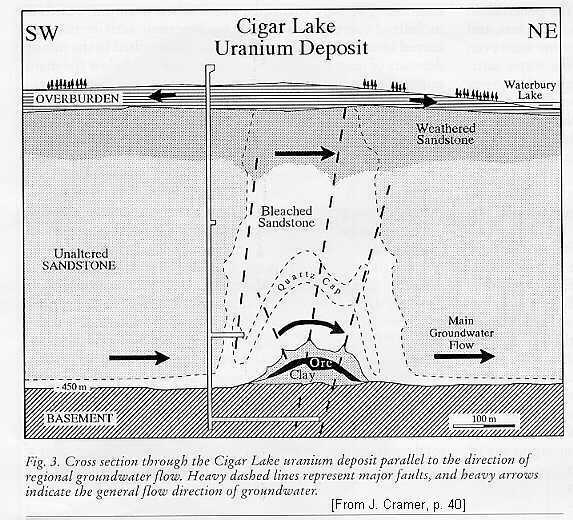 J. Cramer, "Cigar Lake: A Natural Example of Long-Term Isolation of Uranium," Radwaste Magazine, p.35, May 1995. P.K. Kuroda, "The Oklo Phenomenon," Naturwissenschaften, 70, p.536, 1983. "Managing Canada's Nuclear Fuel Wastes", Atomic Energy of Canada Ltd., 1989. "Summary of the Environmental Impact Statement on the Concept for Disposal of Canada's Nuclear Fuel Waste", Atomic Energy of Canada Ltd., 1994. American Nuclear Society webpage on Oklo natural reactors. Historic Waste: Contaminated residues and soil from past industrial processes. This material constitutes over two-thirds of Canada's low-level radioactive waste, by volume (about 1.5 million cubic metres). Generally low-level waste is stored in interim storage facilities, awaiting long-term management. One example is the contaminated soil in Port Hope, Ontario, dating back to a radium-refining operation in the 1930's. Responsibility for historic low-level waste has been assumed by the Canadian federal government. Ongoing Waste: Contaminated material created by nuclear power plants (except used fuel), nuclear research institutions, and medical isotope processing. This material accounts for about 600,000 cubic metres of low-level radioactive waste in Canada. Generators of ongoing low-level waste are responsible for management of their own waste material. Ontario Power Generation has proposed a Deep Geologic Repository for its low and intermediate level radioactive waste, to be located at the Bruce site. provide a public information service on low-level radioactive waste in Canada. A special class of low-level radioactive waste applies to tailings from uranium mining and milling, as well as uranium fuel processing. Over 200 million tonnes of this waste material exists in Canada, confined at or near the sites where it was created. Typically, long-term decommissioning of these sites takes place in situ, involving the improvement or construction of containment dams, flooding or covering of tailings to reduce acid generation and the release of radiation and radon gas, and management/monitoring of tailings and effluent. The newer mining and milling operations in Saskatchewan use pits with impervious liners, designed to redirect groundwater flow around the waste rather than through it. [source: Inventory of Radioactive Waste in Canada (1999), available as a PDF file on the LLRWMO website given below. Generators of on-going low-level radioactive waste are licensed and regulated by the Canadian Nuclear Safety Commission (CNSC). "Inventory of Radioactive Waste in Canada", an annual report by the Low-Level Radioactive Waste Management Office (LLRWMO).